Oil on canvas, 48 x 55,5 cm. In the 1830s and 1840s, Eckersberg was fascinated with marine painting. Despite the loss of the fleet in 1807, Denmark remained a seafaring nation. The ships’ aesthetic must have appealed to Eckersberg’s interest in perspective and at the time, he was the leading painter of marine art. 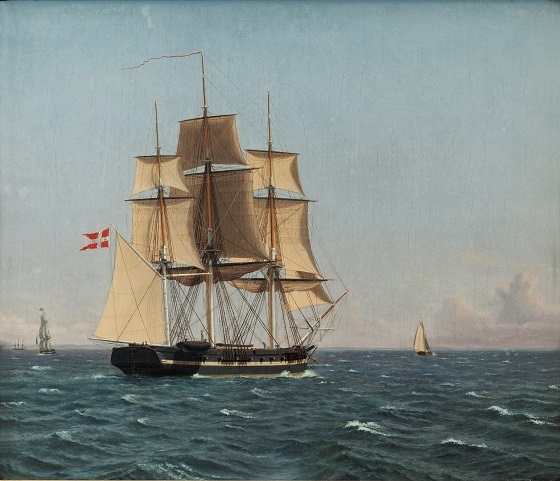 In 1833, Eckersberg took a two-week trip with the corvette Najaden. In the following years, he painted the ship at least five times. The artist carried out many of this type of shorter or longer trips onboard the ships he was interested in. Along the way, he took detailed notes regarding weather conditions, the appearance of waves in various kinds of wind, about which sails the ships used, as well as about the route and manoeuvres in general.